Once the shine has worn off the first asparagus of the season, turn to roasting for a surprisingly robust flavor. Preheat the oven to 425 degrees. 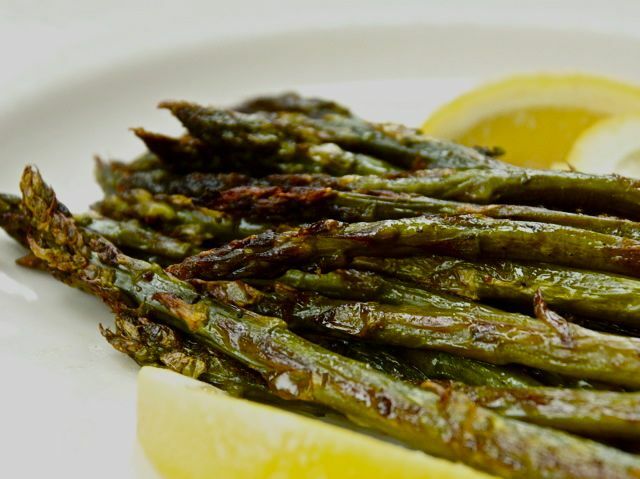 Toss trimmed, peeled if necessary, asparagus in olive oil to coat lightly, season with salt and pepper and set in a shallow baking dish no more than two stalks deep, with a few tablespoons water. Cover and bake 15 minutes. Remove the cover and continue baking until asparagus is tender when pierced with a knife, 10 to 15 minutes depending on its size. Serve on a platter with such accompaniments as lemon wedges, thin shavings of Parmesan or Dry Jack cheese, garlic mayonnaise, pesto, or rustic salsa Romesco.